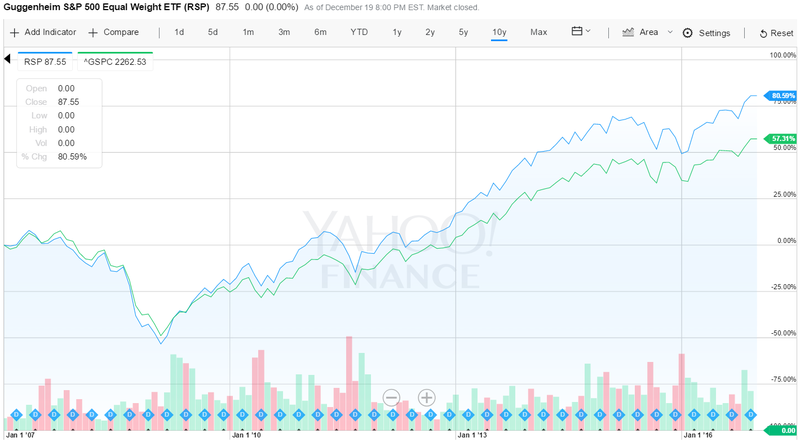 Investing Advice And InformationExchange Traded Funds (ETFs)Will the U.S. Stock Market Soar 20% in 2017? With the New Year almost upon us, Wall Street soothsayers are out with their predictions for 2017. As usual, they are predictably restrained. Most projections from the big investment banks and brokers converge around the S&P 500 closing the year at 2,350 — a scant 5% above current levels. Only one strategist — Merrill Lynch’s Savita Subramanian — dares to suggest that 2017’s gains could be as much as 20%. A 20% gain in U.S. stocks from current levels would put the Dow at 24,000, the S&P 500 at 2,700 and the Russell 2000 at 1,650. Yet, if you combine robust earnings growth, greater infrastructure spending, tax cuts and deregulation with a boost to the market’s “animal spirits,” 2017 could be a banner year for U.S. stocks. I see two crucial factors converging, which could send the U.S. stock markets surging by double-digit percentages in 2017. First, the fog of the earnings recession in the S&P 500 has lifted. This was always somewhat of a red herring, with the energy sector bearing the brunt of the weak headline numbers. Today, energy stocks are recovering, with Dow components Chevron (CVX) and Exxon (XOM) expected to grow earnings by 277% and 84%, respectively. Other S&P 500 sectors are also gathering steam. The current forecast of 11.5% earnings growth and 5.9% revenue growth for the S&P 500 are the best since 2013. The Dow Jones Industrial Average fares even better with earnings expected to surge 14%. Second, U.S. stocks have a strong recent history of outperforming in the first year of a presidency. Since the year 2000, stocks have had three 20%-plus years: 2003, 2009 and 2013. Note that two of the three recent 20% gains came the year after a presidential election. Still, before you pile into U.S. stocks, keep in mind three caveats. First, the U.S. stock market is expensive. Long-term measures of stock market valuation, such as Robert Shiller’s Cyclically Adjusted Price Earnings (CAPE) ratio, puts the S&P 500 at an eye-popping 28.1. That is 68.3% higher than the historical mean of 16.7 — though far from its dot-com boom peak of 44.2. Run the numbers Shiller style and you get an implied annual return of -1.2%. Second, I’m worried about the uniformly bullish market sentiment since the Trump election. The CNN Fear and Greed Index, which tracks seven separate measure of market sentiment, is firmly entrenched above 80. The Consumer Confidence Index is now at its highest since July 2007. When too many investors are on one side of the trade, you eventually run out of buyers. Third, both wage growth and interest will go up under a Trump presidency — whether triggered by a jump in government spending or accelerating economic growth. Either factor will weigh heavily on the stock market. If you cannot resist the siren call of a potential blowout in 2017, how should you best bet bullishly in your portfolio? 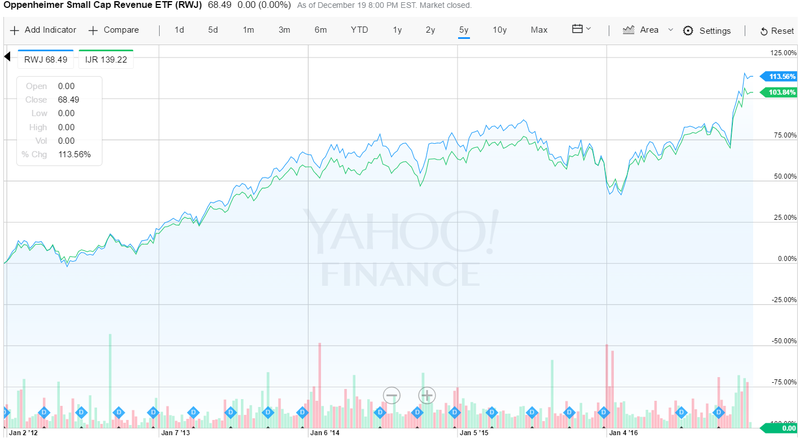 First, realize that both growth and momentum stocks tend to outperform when the bull is in the house. If you expect the big-cap S&P 500 stocks to fare well, you should expect small-cap stocks to fare even better. History is on your side. The Russell 2000 has not seen a negative return in the first year of the last eight presidencies. Second, understand that there is a better way to skin the investment cat than investing in Vanguard-style, market-cap-weighted indexes. I prefer “smart beta,” or alternative indexes, with a strong track record of outperforming their traditional market-weighted rivals. RSP’s strategy is deceptively simple, yet robust. The Guggenheim S&P 500 Equal Weight ETF (RSP) ETF owns all the stocks in the S&P 500 and invests equally in them. This equally weighted approach generates a very different portfolio than its market-cap-weighted counterpart. While the 10 largest stocks make up 19.06% of the S&P 500 Index, in an equal-weight portfolio, they make up just 2.5%. First, with its equal-weighting strategy, RSP overweights smaller-cap stocks. The average weighted market cap for a stock in the RSP portfolio is $22.4 billion, well short of the $79 billion for the S&P 500. And small and medium caps outperform large-cap stocks over the long term. Second, the equal-weighting strategy systematically sells recent winners and buys past losers when it rebalances each quarter. While market-cap weighted indexes tend to overweight the most expensive stocks, RSP invests in cheaper stocks. RSP has beaten the S&P 500 Index with annualized returns of 7.84% in the past 10 years, versus its benchmark of 6.89% for the S&P 500. The Guggenheim S&P 500 Equal Weight ETF (RSP) celebrated its 13th birthday in 2016 and boasts a four-star rating from Morningstar. RSP has $11.08 billion in assets under management and a net expense ratio of 0.40%. With a beta of 1.03, it is only slightly more volatile than the S&P 500. Academics and practitioners have studied the small-cap effect for decades. Their conclusions are clear: if you have a long-term time horizon- and you can stomach the volatility- you should invest a big chunk of your money in small cap stocks. That’s why I’ve invested 100% of my son’s 529 college savings plan in the sector. There are a few caveats. Although my two-year-old does not complain about volatility in small caps, many adults do. Small caps can underperform broader markets for years at a time, as they have since a rip-roaring 2013. But if you’re looking solely for the biggest returns, small-cap stocks are the way to go. Small caps’ outperformance is due to a handful of big winners rather than the asset class as a whole. In a high risk, high return sector, you get a lot of duds. Here again, alternative indexes offer a solution. RevenueShares Small Cap Index (RWJ) invests in the same stocks as the S&P Small Cap 600 but weights them according to top-line revenue instead of market capitalization. Even the most creative accountants find it tough to fudge revenues. This methodology favors certain industries: consumer stocks and industrials dominate while it underweights financials. Editor’s Note: I’m not usually one to toot my own horn. But I’m happy to report… the algorithmic investing strategy I’m using in my Bull Market Alert trading service is paying off in a BIG way. To quickly summarize, all but two open positions are up as of this writing, and my most recent seven picks have all closed with double-digit percentage gains. If you’d like to learn more about my approach (it’s based on the same algorithm technology used by the NSA, Google and Facebook), I invite you to check out this research I’ve put together. In case you missed it, I encourage you to read my e-letter column from last week about how I expect the small-cap companies to soar going into 2017. Low expenses and fees are only two of the factors that make ETFs effective investment vehicles. You can improve your returns even further by purchasing ETFs for free -- without transaction fees. Exchange-traded funds and mutual funds are similar in some ways. Both hold a variety of securities, provide easy diversification and trade on the exchanges. However, mutual funds are bought and sold only at the end of the day. However, ETFs trade throughout the trading day just like individual stocks.